Shea butter in combination with Argan oil and Vitamine E, which are rich in antioxidants, is suitable for the mature or very dry skin and hair tips. Shea butter in combination with Pomegranate and Aloe Vera, which is known for a skin soothing and moisturizing impact, is suitable for dehydrated and stressed skin. 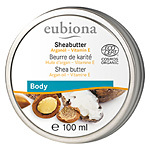 The eubiona shea butter is now available in the usual product quality, but NEW with a screw cap - easy to open and close again! Nanomaterials are defined as non-soluble or bio-persistent substances, produced intentionally, characterized by one or more external dimensions or by an internal structure, on a scale of 1 to 100 nm. 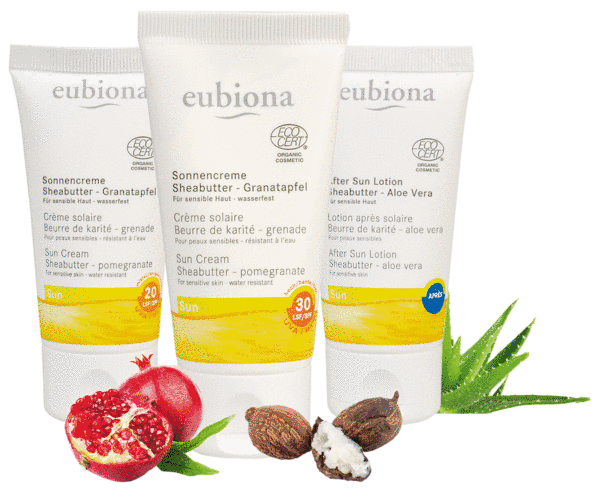 The eubiona Sensitive Care line protects and cares for the skin containing the reliable active agents: oat, jojobaand evening primrose. Protect skin in the sun! The Face Care line Aloe Vera which is suitable for normal and dry skin has been extended by a Cleansing Gel. Soft cleansing gel for daily care. Aloe Vera and pomegranate provide the skin with moisture, calm it and help to stabilize the moisture content. Ideal for make-up removing. It is also suitable for sensitive skin. Utilisation: Apply to the moist face and decolletage skin in the mornings and evenings. Wash off with plenty of warm water. Afterwards, take care of your skin as usual. 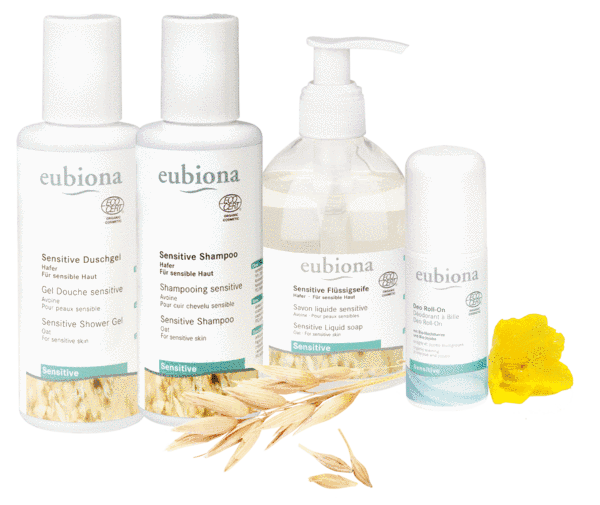 The eubiona Sensitive Care line has been extended by three carefully composed care products with oat. The care line protects and cares for the skin containing the reliable active agents: oat, jojoba and evening primrose. 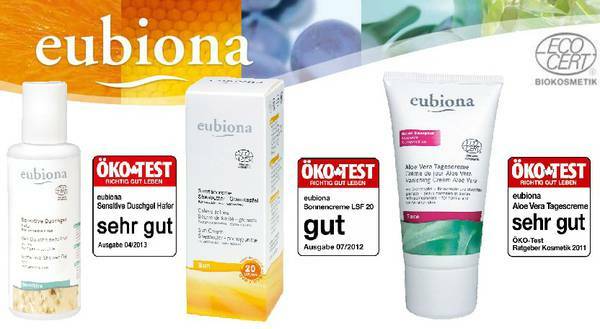 In combination with very mild sugar tensides, the sensitive eubiona care products are particularly suitable for very dry, reddened, irritated as well as for allergy-prone skin and for the sensitive armpits area. Liquid soap, shower gel and shampoo cleanse gently and can be applied to skin and hair several times a day. The sensitive deo Roll-On gives beneficial and reliable freshness throughout a day. Oat is particularly suitable for skin care as an energygiving substance because of its contents of vitamins B1, B6 and various amino acids. Oat can actively cope with skin disorders. It moisturizes, calms and makes the skin smooth. It is said that oat positively affects skin suffering from neurodermatitis, psoriatis and chronic eczema. Selected mild tensides possess particularly mild cleansing and protective properties for the hands. Organic oat soothes the skin, alleviates red, itchy skin and maintains the skin’s moisture balance. The liquid soap is therefore highly recommended for very dry, itchy or allergy-prone skin. Ideal for frequent use. Selected mild tensides possess particularly mild cleansing and protective properties. Organic oat soothes the skin and alleviates red, itchy skin. It is therefore highly recommended for very dry, itchy or allergy-prone skin. The shower gel can be used with all skin types and may be applied several times a day. Selected mild tensides possess particularly mild cleansing properties. Organic oat soothes the skin and alleviates red, itchy skin. It is therefore highly recommended for very dry, irritated and allergic skin. The shampoo does not leave any irritating residue. It adds volume to the hair and prevents it from becoming greasy. New hair gains a natural fullness, buoyancy and shine. The shampoo may be used several times a day even with sensitive skin. with 100% African shea butter. The butter can be used in many different ways for the whole body. It is an ideal care for particularly strained skin areas on elbows, knees, hands and feet as well as chapped lips or the strained ends of the hairs benefit from the outstanding care qualities of shea butter. Tip: To achieve best effects shea butter is to be rubbed in the slightly wet skin directly after having bath or shower. Face Care: Shea butter can be used as a day cream or as a foundation for your day cream. Body Care: Shea butter ensures good relubrication, regulates the skin moisture content and protects it from becoming dry. It makes the skin soft and smooth and it is perfect for particularly strained skin area such as hands, elbows, knees and feet.Shea butter supports the skin resistance and therefore a massage using it helps to avoid the emergence of stretch marks and skin growing slack during the pregnancy and breastfeeding time. Tip: To achieve the best effects shea butter is to be rubbed in the slightly wet skin directly after having bath or shower. Hand and Feet Care: Rub in after washing or if needed. Hands become soft and well cared-for. Rough callused skin becomes soft and smooth. Lip Care: Shea butter protects the lips from becoming dry and cares for chapped and rough lips. Massage: A massage with shea butter is very pleasant and cares for the skin. The butter can be warmed up for this purpose (see the information above). Baby Care: Shea butter is suitable for whole-body care and cleansing in the area under nappies. It calms irritated and reddened skin. Hair Care: Shea butter regenerates affected hair. Rub in a small amount of shea butter in the ends of the hairs one or two hours before washing it. Wrap the hair in a towel and let it work in.